Since the holidays are in full swing, I have been baking like crazy, testing and EATING lots of goodies! Unfortunately, it always takes me longer than I expect to post a recipe, even with the crazy amount of baking I`ve been doing. And, this daylight savings thing...? Not working for me. :( By the time I get home from work, it`s pitch dark. I can never take any photos of the food I bake after work. To make up for the natural lighting, I wake up really early (at least to me...hehe) to take photos before rushing off to work. I also have to control myself around all the freshly baked goodies at night, since I need to photograph them the next morning. Talk about crazy self-restraint! Those warm cookies and muffins are extremely tempting after a long day! 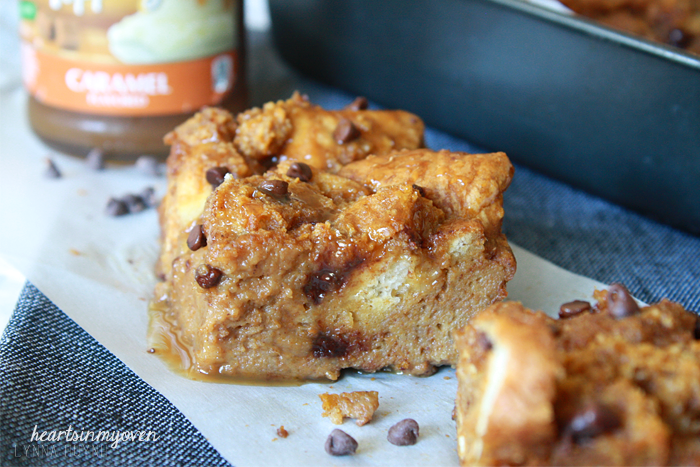 Okay, so this pumpkin nutella bread pudding is amazing. Pumpkin-everything might be winding down, but trust me, if you have to bake one last pumpkin dessert this season, you`ll want it to be this one. I`m not lying when I say that I basically gobbled this whole pan by myself. I couldn`t help myself, it was so addicting. P.S. 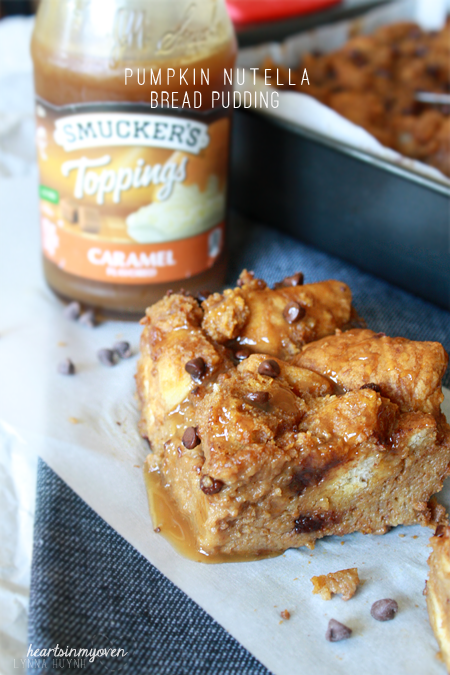 If you can`t tell, I drizzle that caramel ice cream topping on, basically, everything. Full of yum! 1. Preheat oven to 350°F. Line an 8 inch nonstick square pan with parchment paper/grease well. 2. In a medium bowl, whisk the cream, milk, pumpkin, Nutella, brown sugar, sugar, eggs, yolk, salt, cinnamon, ginger, allspice, and cloves together. 3. In a large bowl, place your cubed bread in. Add the pumpkin/milk mixture. Toss with rubber spatula gently to coat. 5. Sprinkle with mini chocolate chips. 6. Bake for 25-30 minutes, or until set. 7. 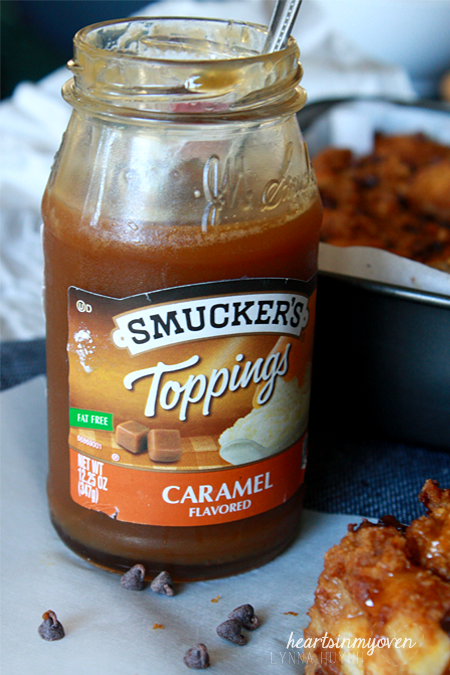 If desired, drizzle with caramel. - Serve warm, room temperature, or cold. Recipe can be made in advance and refrigerated.